USD has been losing momentum due to poor Durable Goods Orders report. the German IFO Business Climate Index will be released today and it may give arise to EUR. The support rests at 1.15990 with resistance at 1.16690 which both lines are above the weekly pivot point at 1.15530. The EMA of 10 is moving with bullish bias in the ascendant channel and it has reached the EMA of 200. They are both above the EMA of 100. The RSI is moving above the 50 level, the Stochastic is showing downward momentum and the MACD line is above the signal line in the positive territory. The ADX is showing buy signal. 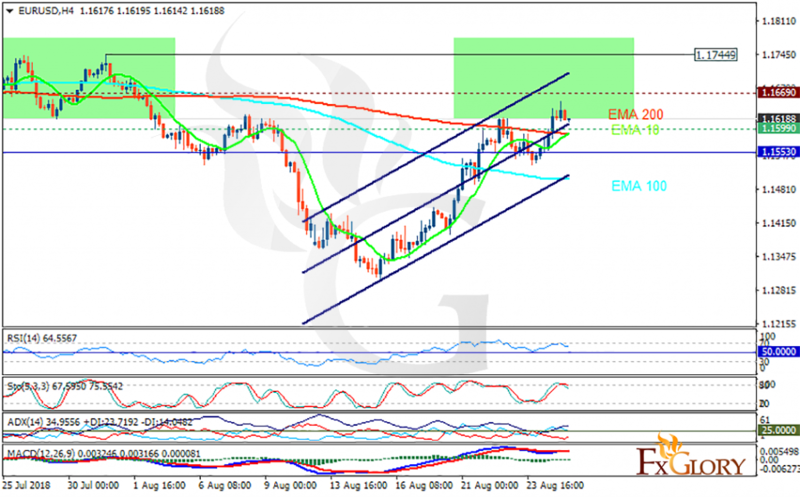 EURUSD has shown enough support at 1.156, the pair may continue its bullish trend towards the previous high at 1.17.